One of the perennial issues that comes up with the CRL, is what to do about Grafton and Newmarket. These two stations have become pretty popular for those coming from the west and large numbers, perhaps up to 40% of people on some trains, disembark there. Grafton in particular has seen its patronage grow pretty rapidly since opening in its current location in 2010 and is used by not only school kids from nearby Auckland Grammar and St Peters College but by people who work at the hospital and many office workers from the buildings down Carlton Gore Rd. In the future it is also likely to be popular when the Lion Brewery site eventually gets redeveloped. When we built the CRL these passengers are rightly going to expect that it is still easy for them to get to yet the location of Grafton in particular is probably the hardest to deal with. The downside of course is that CBD bound passengers which make up the majority of passengers have to take the long way around town. Further due to the constraints at Britomart and Newmarket with having to turn trains around there isn’t really any opportunity to improve frequencies. This means the most trains we would run from out west is about one every 10 minutes. Now for the sake of this post lets say you wanted to get from Mt Albert to Grafton and you are not the kind of person who has memorised the timetable. On average upon arriving at the station during the peak hours you would need to wait for about 5 minutes till the next train showed up, with EMUs the journey to Grafton would be about 10½ minutes so all up the trip would take on average 15½ minutes. The problem with this though is that patronage is simply not ever likely to be high enough to justify a decent frequency. I know that some people would love to see a West to South service but I can’t see it being viable and that means that the example from above gets worse as your average wait time will increase or make relying on a timetable much more important. Even if we could get a West to South service running once every 15 minutes it would leave you with an average of a 7½ minute way and a 10½ minute journey for a total time of 18 minutes. Using a pattern like the one suggested in this post would allow for us to easily run one train every 5 minutes on each of the lines during the peak times, perhaps slightly more. Turning up at Mt Albert station you would only have an average wait of 2½ minutes before the next train arrived to whisk you away. Getting close to town your train would then head down the tunnel until it got to the Symonds St station which would take about 8.5 minutes. At Symonds St you would disembark the train and wait till the next train heading out to Grafton/Newmarket turned up which again would be an average of about 2½ minutes. Another two minutes on the train and you would arrive at Grafton. All up the journey would take about 15½ minutes which is no different to the pre CRL situation. Now now improvement doesn’t sound that startling however it would likely also be possible to have the transfer at Symonds St timed with the train heading in the opposite direction to cut out that down time and bringing the total trip down to 13 minutes. What this means is that by keeping the network simple and running at a high frequency we can actually negate the loss of a direct connection to Grafton and Newmarket and if we time our trains right then it could actually end up faster for people than it is today. Of course it would require both the Eastern link and Symonds St station to be built up front. Another thing to consider with the last option is that by boosting the frequencies to a train every 5 minutes it also benefits travellers going from places like Henderson to New Lynn. Suddenly people out in the suburbs have access to a really high frequency service that would not have been able to be provided otherwise and which would help to encourage more people to use the train. Hopefully we can keep it simple, frequent and fast so that everyone can benefit. There is an argument for a Western Line Station between Kingsland and Newton as there will be a long gap between them and there is a catchment. Balancing against that is that any additional stop slows the route down, same argument for and against any new station. It would be west of the tunnel entrance and spilt north and east, and a relatively cheap surface station nearer to Dominion Rd than the current Mt Eden Station. This offers the option of a two platformed Dom Rd/Mt Eden station too for transfers- with a walk- like the current Penrose arrangement. Although depending on the detailed design of the new track layout they may end up quite a distance apart….? SteveC, if you look closely at the diagram Matt’s green western line continues through the CRL and Britomart and carries on through Parnell and Newmarket to become the southern line, and vice versa. You couldn’t remove any track through Newmarket, they’d all be in use in all three directions. In fact Newmarket would be the equal busiest station on the network. Sorry Steve I was reading too much into the in/out comment I think. The idea is basically to have the four main suburban routes arranged as two long through routed lines that share the CRL in their middles. Yeah you’d be crazy to remove the Kingsland to Grafton line, for a start it would still be a pretty busy freight corridor and without it the North Auckland line would be disconnected completely! Could also be useful for things like Eden Park specials from the south, and if we ever wanted a regional or intercity passenger service to the outer west or Northland it would be necessary. Echoing Nick’s comment there with the NAL and freight that runs through it. While freight running through the NAL up to Northland is dismal at the moment, the line needs to be retained in its entirety especially as Marsden City gets built, Marsden Point gets extended, and Kiwi Rail get round to building the Marsden Branch Line that connects to the NAL. The only way I can see freight skipping Kingsland – Newmarket is if the South West Line from Avondale to Westfield via Southdown was built – but that has issues in itself. note there is a reasonable amount of shared catchment between Newton and Grafton and Symonds St station. For example is the same distance (800m) from Symonds St station to the Park Road/Grafton Bridge intersection. Also shouldnt get too hung up on that 40% figure as a reason not to build the CBDRL as some people do. All that tells me is the train catches a higher proportion of the trips to and from Grafton/Newmarket, due to the speed of this journey no doubt. This proves that much more people will catch the train to the CBD if journey time improves as it greatly will with CBDRL. Do you know if CBDRL is planned with island platforms? This would help with these transfers, even if it just at Symonds St station. However I guess would need wider tunnel and kinks in station approach tracks so may be more expensive. Yes the concepts I have seen are for island platforms, I assume they would be the only way to do it unless they had some peculiar engineering problem that made side platforms much easier to build. Indeed that would make the transfer very simple, just walk a few meters across the platform. As Jarret Walker says in his book, that’s only as hard as moving across the living room from the sofa to the lazyboy! Furthermore there could be a good case for timing the trains to meet at Newton, if that were done there would be no time delay from transferring at all. Because both trains would stop at that station anyway it doesn’t add anything to the timetable, and transferring would take only as long as you’d spend stopped at any other regular stop. The minor inconvenience of walking a few metres from one chair to another opens up a cornucopia of network design efficiencies. Here’s a peculiar engineering problem that’d justify side platforms: staged stations. Unless the platforms were completed entirely during the cut-through, I really struggle to see how island platforms could be completed with the CRL operational without impacting train operations. Side platforms would probably be harder than an island in this case. Remember the tunnel through the stations in question will actually be two bored tunnels about 15m apart, one for each track. The station/platform would be dug out in a cavern between these two tubes, the platform actually being two platform faces with a series of galleries/linkages/concourse between them. However the key thing is they are still an island and transferring could be done by walking from one edge to the other, there is still no need to go up escalators, over the tracks and down the other side. So it would be like Melbourne’s Parliament and Flagstaff station, which were constructed from the inside out like K Rd and Newton would be. I’m a bit confused… Does this mean western line customers travelling to Newmarket will either have to go via the CRL tunnel or transfer at Newton/Mt Eden? That is our suggestion, yes. Coming from the west you would have the option of either transferring at Newton for a quick direct trip, or if you couldn’t be bothered moving you could stay on the train an extra seven or eight minutes to get to Newmarket on the less direct route via the CRL tunnel and Parnell. Because the vast majority of western line travellers will be going to the CRL stations it makes sense to take the line there first and to Newmarket second, rather than detouring most people around where they don’t want to go. But as Matt points out the frequencies would be so quick that making the transfer at Newton instead would still only take about as long as the direct route does today. If we can get people on board to the idea that connections make things far more simpler and efficient and can acutally save time then we will have ourselves a very effective rail network. Another useful point is that people who now transfer at Newmarket for Southern line trains will in future transfer at Symonds St instead of Newmarket, so no extra transfers. Also depending on service patterns some may not have to change trains at all as their train will continue on via Eastern Line to Manakau. people at underground stations all over the world make vastly more complicated transfers than that every day. Some of the London stations are real mazes as there are many lines at different levels. Also some in Barcelona some stations have 500m plus long walks between them. Which all goes to argue against the concept of staging the stations. If you do stage the stations to save money then those transfers as discussed above won’t be possible as the stations won’t be usable for years. And Luke has it right, we need people who use the trains to start thinking of become an active part of the transport system and actively change trains at the appropriate stations to speed their journeys up rather than passively let the stations come to them as they do now. Thats what other transport system around the world do and so should we. Matt L – sorry having trouble following some of this. AT seem to say post EMU and CRL western frequency is 10 min?? The CRL part is limited to 50km, and would have larger passenger movements both off and on, so increased dwell times at the stations? I’ve assumed this gave us the 10 min – ie the achievable frequency on the whole line? If you have a southern CRL that people can change to at Symonds St, does that carry on around the loop? I thought there wasn’t going to be a loop service? If it carries on down South, how can it be 5 min, when it has to slot into 4min switching on Southern? wouldn’t it be 10min? ie joins in between 5min frequency on southern line? But how would Newmarket/grafton get back out west? In your original diagram you had both western and southern travelling out of CBD on CRL – so again that would mean we’d have 10 min on the western from Mt Eden west? ie one train goes south at 5 min, and next goes west at 5 min? Anywhere I can find the AT proposal of how thsi will actually work? AT haven’t released any proposals for which way the lines would run with the CRL, they are still working out their own ideal outcomes and that will depend heavily on what parts of which junctions get built. So in the mean time its up to us to speculate. -We will have ten minute frequencies (6 an hour) on the western line in two years with electrification, we can handle that as it is. Seven or ten years from now with the CRL built we’d expect to have much better frequency than that, probably five minute (12 an hour) or better. -Where do you get that the CRL would be limited to 50km/h from? 80km/h in a tunnel would be the norm. Anyway that doesn’t bear much relation to dwell times or maximum headway. -No it doesn’t carry on around the loop, it heads south through Newmarket to Remuera and beyond. Currently the maximum this could handle would be six minute headways on each of the two lines sharing the track through Newmarket (i.e. three minute blocks overall). Improvements to Newmarket junction would be required to get to 5 minute headways. Line one comes in from the western line, enters the CRL at Newton, exits at Britomart, heads up to Parnell and Newmarket, continues south as the southern line. It operates this pattern in both directions. Line two comes in from Manukau along the eastern line, enters the CRL at Britomart, exits and Newton, goes via Grafton to Newmarket and continues south to the Onhunga branch (and eventually the airport). Also operates both directions. So the lines double up in the CRL from Newton to Britomart, and also double up from Newmarket to Penrose, and again from Otahuhu to Puhinui. So the maximum that could be run on each of the routes is half the total that a two track line and junctions could handle. Without any special treatment to the junctions that translates into 3 minutes total, or a train every six minutes on each line. With special junction design we might get that down to two and four respectively..
No AT proposal yet that I am aware of. There are many different options for operating the CRL and we have plenty of time to discuss it. I can see how direct non CRL West – South trains may be useful, as otherwise to go from West to South you would need to transfer twice. However I wonder whether the demand is there, it may be easier to catch a cross town bus (if they ran at better frequencies) if you are going to the inner southern line area. It would be interesting to see if we ran West to South trains via the CRL as proposed; whether people did transfer twice or if they stayed on the train if they were going west. There may be an argument to instead connect the Eastern and the Western lines rather than the Western to the Southern. This would force a transfer to get from west to Newmarket. However it is likely that it will be a more useful route as I would see that people are far more likely to use rail to go from Meadowbank to Mount Albert than perhaps from Ellerslie to Mount Albert, simply due to the geography. You would then have the Southern / Onehunga line looping back onto itself. Won’t there be MIT students from West AK? MIT with a campus right on top of MC Station…. I can see west/south demand, one transfer is ok , two starts to lose appeal i reckon, at least that’s how I used to think in London…. But I do appreciate the disadvantages of the both the complexity and the lower frequencies of a variety of running patterns. And frequency is a killer App; nothing like turn up and go. Daniel Moylan from Transport for London reckoned 10 min is the outer limit, maybe 15 at a pinch but really you should aim for 5. For as much of the time as so can, including weekends and holidays. Anyone know if there is any chance these new trains could be upgraded to driverless? Too tricky mingling with freight services? With only two lines any pair of stations on the network is never more than one transfer away, although there are places where you could take a short cut with an extra transfer. Ugrading the new trains to driverless isn’t really feasible, and in any case driverless operation is basically impossible where mixing with freight and other locomotive trains occurs. Also there would need to be no level crossings and the corridor would have to be very secure. Having said that not every part of the network needs to carry freight, there may be the potential to convert entire lines to driverless passenger-only operation. It’s probably just easier to leave the existing ones how they are but go driverless on any new lines we might build. You would be able to do west to Manukau with one transfer. Change trains at Aotea or Britomart to an eastern line train. Transfers add time to journeys too, especially at any station that requires passengers to move to another level (or even worse, negotiate up a level and then down again to move from one platform to another). Crowds make stairs and right angle turns a real choke point. In my real world experience (London and Singapore), you should allow 10-15 minutes for a peak hour transfer between lines with a 5 minute frequency. Even on lines with a longer period between trains, you will run in to issues with peak time trains being too full to allow transfer passengers to board. Any more than one peak time transfer on a major transport network, and you can only accurately predict your arrival time within a half hour window. Not sure on the 2 or 3 min you mention. I thought emu/new switching was min of 4 min? ie a train can never be closer than 4 min to previous? Maybe AT/govt 10 min on western is right? Under your proposal aren’t line 1 and 2 sharing the Britomart to MtEden part at say 4-5 min frequency? so every second 1 is 8-10 min heading west? and 8-10 min for Grafton/Newmarket ones? We already achieve better than three minutes headways each way through the flat Quay Park junction and the Britomart access tunnel, so we can do at least the same across the rest of the network. My understanding is the new signalling allows for 3 minute headways in service, but the bidirectional signalling in the Britomart tunnel allows for a little more than this again (like up to 24 in and out an hour). Can anyone confirm the exact numbers? 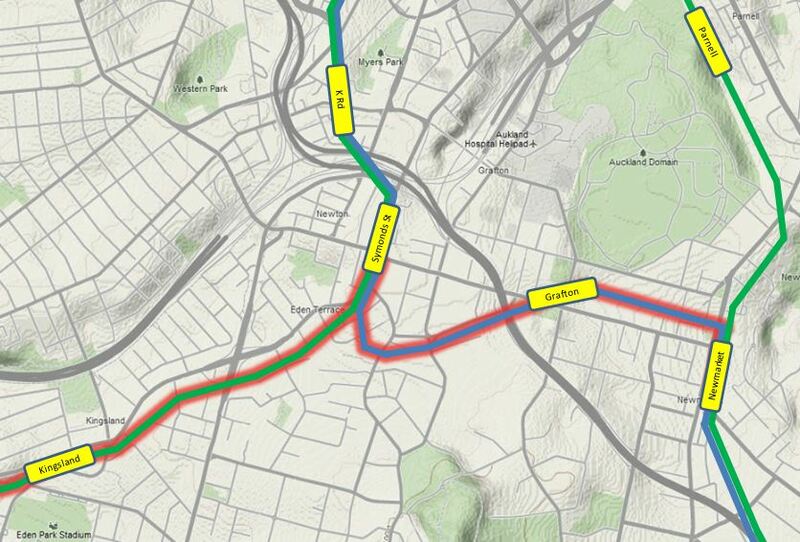 Yep so under our proposal you have the two lines sharing the tunnel Britomart to Mt Eden. So heading toward Newton every second train goes straight west, alternating with trains to Onehunga via Grafton and Newmarket. Going the other way every second goes to the eastern line and south via Parnell and Newmarket, respectively. So if the CRL and it’s junctions can handle a train every three minutes then each of the lines could operate once every six minutes. Slightly tangental, but there was some brief discussion upthread about a relocated Mt Eden station, between Kingsland & Newton/Grafton. If placed at the Dominion Rd / New North Rd overpass, potential to be a catalyst for that neighbourhood’s revival, esp if said overpass is deconstructed….. Provided the eastern link is built, Grafton will be served by most, if not all trains, as the loop portion of the journey will still use that station, just like any other station on the loop. The loop stations will be Newton, K Rd, Aotea, Britomart, Parnell, Newmarket and Grafton. There shouldn’t be any reason for a train to miss Grafton. I doubt that train pattern would ever be run. It creates too many conflicting movements at the various junctions and what do you do about Newmarket? You still haven’t resolved the problem of Western Line trains having to reverse. There shouldn’t be any issue at the junctions because they should be grade separated. The Newmarket reverse, as far as I am aware, is not a problem to be solved. It was designed that way. The best operating pattern is one that keeps each line separate so as to contain any operational issues to that one line. The only way to keep each line separate is to built a tunnel for each of them and that clearly isn’t going to happen. It is also not going to be possible to grade separate everything and I hear that the hardest bit is probably the eastern link. Even if the Newmarket reverse is designed to be that way, it does not make it a good train movement. It creates a frustrating delay on the Western Line that can be avoided post-CRL with a different operating pattern. You don’t see Melbourne’s tunnel with at-grade junctions at each end. Every link is grade separated, and if the CRL is going to be built by replicating the problematic Quay Park junction at Mt Eden, then really we need to ask whether Auckland is ready for the CRL. The optimum operating pattern is to have all trains do a full loop and then go back to the line they came from. This ensures quick and easy access to all loop stations for all passengers on all lines, and keeps the trains on independent routes to minimize flow on effects of when things go wrong. Agree with your first point, but not the second: Cross town travel is very important your model simply repeats the CBD focus of the current system. And is overly complicated, too many conflicts and yes Newmarket? just bypass it with your loopy running?, or keep the back and fill? Patrick – agree re too CBD focused. I don’t understand why they want to replicate the mistakes of the bus network – especially when we’re finally getting successful loop services. For any PT to work, home and work need to connect. Council and AT are way over-stating job growth in CBD. Half CBD is being lost to student accomodation/foreign schools, and jobs either have or will move to waterfront/west. But none of those corporates in banking/insurance/telcos are going to double their staff there! if anything will remain static. Does anyone think Air NZ/Telecom/Vodafone will double their space/staff in the next 30yrs? So why isn’t Avondale/Southdown a greater priority? Has it been modelled against the CRL? On my favourite Western line 40% get off at Grafton/Newmarket – if maybe 10% then go south, that’s a greater capacity increase than CRL – but also deals with the 100% full issue from Morningside – ie if those people take the Avondale/Southdown route. There is still quite a bit of space for growth in the CBD, especially to the west but there is only so much capacity into the area due to the city almost being like an island due to the impact of the motorway. We won’t see that growth unless we can get more people into the area and there simply isn’t the capacity on the rest of our transport networks to do so. Yes large numbers get off at Grafton and Newmarket but forecast demand from the west indicates that perhaps only 20%-30% will be heading there as demand to the CBD increases at a faster rate. Also from my personal experience, of the people that transfer to head south, most are going to places like Ellerslie so I don’t know how much demand there is for other stations even further South which means they wouldn’t really be benefited by the Southdown-Avondale line (SAL). I think the SAL should be constructed intially as a spur to Dominion Rd as that part should be fairly cheap due to the corridor already being owned, designated and will be largely grade separated due to the motorway works. It could act to help free up the capacity of buses for people closer to town. Looking at land use patterns the bulk of demand would be from Greenlane to Otahuhu, that’s where all the employment is at least. I think there is too much CBD concentration – but to get the best out of a newtwork wouldn’t you want full use each way? So it’s not just people coming in from the west, but also people going to jobs in New Lynn,Avondale/rosebank or Mt albert etc. Western line hits capacity into CBD very early. So no point in apartments around Kingsland or Monringside, if we think they’re going to get to CBD – am peak those trains will be full by then. I’ve alwasy argued for more jobs on rail – so current planners view of more apartments around Morningside, should be changed to more jobs – then capacity is freed as people get off there. Your Dom rd idea also works both ways, as that area is going to grow more industrial due to sh20/transportation. So it could become a job destination. CBD is an “overhead” to the real economy ie the lawyers/insurance/banks etc – necessary, but not creating/exporting. We need to support the commercial/industrial areas. And that is where PT should follow industrial growth (often based around roading, as these businesses need to move frieght). So as roading improvements are planned in Penrose/onehunga, we should back up with rail to southdown. I think we should see it as a package ie you get PT and roading for freight. And see it as a combined business case? Mark I think you should have a look at Ed Glaeser’s The Triumph of the City just to check your assumptions on the role the centre of a city plays in its overall economic performance. Which is not to say that I disagree about the value of other centres, not at all, but that the global pattern is for them to rise with the centre and not instead of or in competition with it. Anyway with the revolution in connection that the CRL will offer I trust the market to grow where it suits it best… I anticipate, all else being equal, that we will see both res. and commercial vitality lift all along the Western Line, but also ex-urban centres on the Southern could be in for a kick, esp. if electrification gets to Pukekohe soon [but not only]. And improved interplay with the CBD should see this as a ‘lifts all boats’ situation…. Though am still hoping that AC will at least make special TOD zones along transit corridors. I’ve done a little figuring on the number of jobs in the Auckland CBD from the census data. If we take the area covered by the CRL and existing city stations (I.e the core CBD, plus Newton, Grafton, western Parnell and Newmarket) then it actually accounts for a full 25% of the whole region’s employment. To put that in perspective, that’s more than west Auckland and the North Shore put together. A focus on the central city is more than warranted. I disagree about the assertion there shouldn’t be more apartments in the Morningside area. Surely it’s one of the prime spots in all of Auckland to allow massive apartment building. Melbourne’s tunnel is a dog to be honest, not something we should replicate. A huge piece of infrastructure that struggles to achieve half the throughput it could if the same tunnels were arranged as through lines rather than balloon loops. FYI the Clifton Hill loop isn’t grade separated either. I can’t see why anyone could think a loop in Auckland would be optimal. We’re talking a 9km circuit with seven stations plus the end change at Newmarket. Who the hell is going to ride around a 9km detour to get to the end station?! That’s neither quick nor easy, in fact it’s slow and arduous. Anyway a loop pattern including Newmarket would be horribly inefficient, sending half the trains on the network over Newmarket junction twice on every run would slash the system capacity to about 28 trains an hour, not many more than we run today. I agree with Geoff and looping the three lines ( or maybe only two of them with the other going through Aotea and on to the Shore). Grade separation is a must if not initially then in the mid-term. You will need a new underground platform at Newmarket for the western line so as to avoid the reversing. This is no more CBD focused than any other configuration as you can swap to any other line with one transfer ( We are limited by the physical route of the existing lines). The big advantage is it will transform the areas of the CBD that are within a station catchment as most of the CBD will become walkable as there will be high frequency trains around the loop in both directions. The economic benefits of this will not be something to sneeze at. Peter I cannot see any major conflicts that could not be addressed. Could you itemise some of the bigger ones?